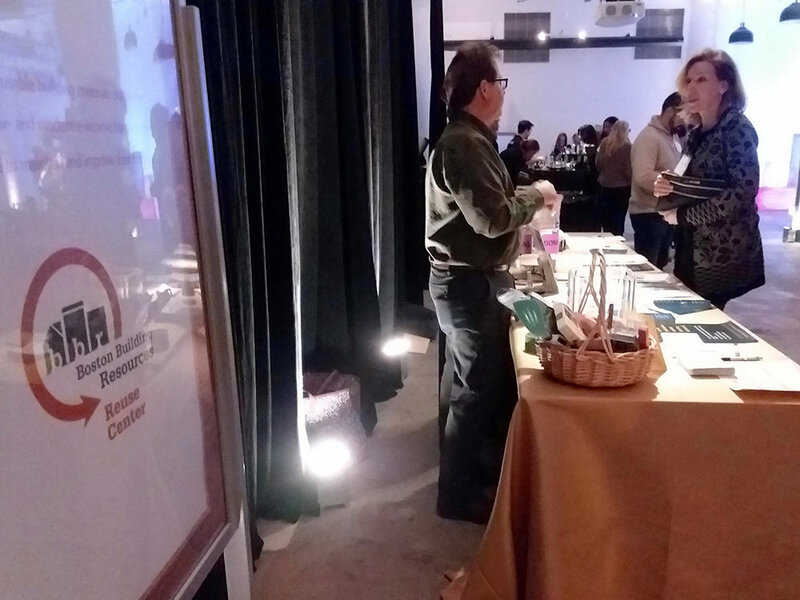 Leaders from the construction and architecture communities learned about the Reuse Center at BBR and had the opportunity to support the mission of reuse on December 12 at the Best of Boston Home event, presented by Boston Magazine and held at the Boston Design Center. More than 260 people attended the cocktail-style reception, which honored the 2019 Best of Boston Home winners, including architects, contractors, landscapers, decorators, and more. The Reuse Center at BBR was the event’s charitable beneficiary, so volunteers and staff organized a table where attendees could learn more about the possibility of donating used and surplus building materials. This way, good-quality items such as cabinet sets, appliances, light fixtures, windows, doors, and other building materials can be reused rather than wasted. Best of Boston Home Event attendees learned more about donating used and surplus materials instead of throwing them away. The Reuse Center at BBR was the Best of Boston Home Event charitable beneficiary. The event was held at the Boston Design center. BBR staff and volunteers attending included (back row) Rick Ames, Craig Miller, Glen Gurner, (front row) Sonia Singh, Matthew St. Onge, DeAnne Dupont, Deb Beatty Mel, and Sakheni Dlamini. A total of 68 companies received Best of Boston Home awards. Approximately $1,000 was raised through ticket sales and contributions made at the time of ticket purchase. In addition, about $600 was raised through a silent auction that included donated items from the Boston Red Sox, Foxwoods Resort and Casino, Hilary Law Textiles, Institute for Contemporary Art, JP Licks, New England Patriots, and Patagonia. A basket of goodies for a prize drawing was donated by FoodLink.